An overall view of Cwt y Bugail quarry looking north. 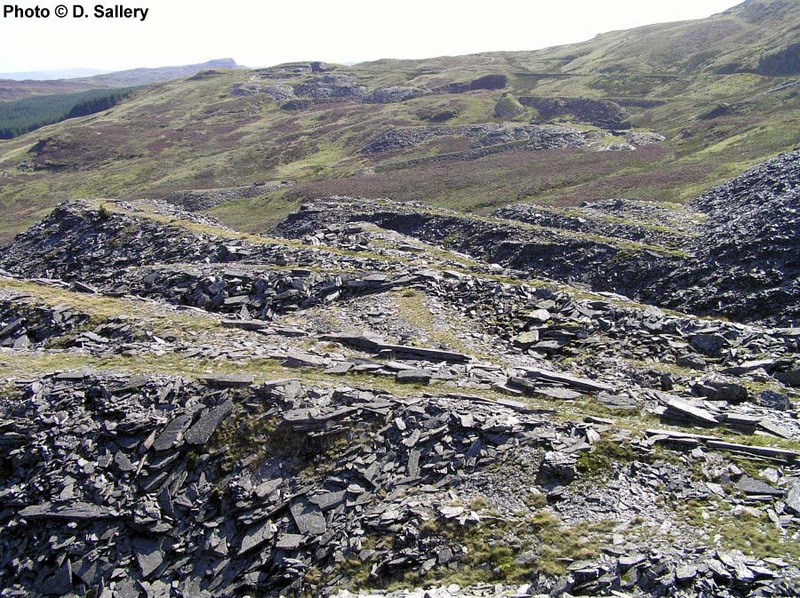 This quarry is the original Cwt y Bugail - The Shepherd's Hut, it was also known at one time as The New Welsh Slate Co. As previously mentioned the name Cwt y Bugail has now also been applied to Manod Quarry, which has rather complicated the formation of this web site! Quarrying began on this site in the 1820's and large scale development followed its connection to the Tramway in the 1860's. Output built up to over 3,500 tons per annum in the 1870's when the maximum number of men - 116 - were employed. Because of its remoteness, the quarrymen lived in the large barracks block, the walls of which still stand. The quarry is a mixture of open and underground workings and the machinery and inclines were originally steam powered, steam power being replaced by an oil engine after the second world war. The connection to the tramway is rather steep and the loaded wagons were originally cable hauled up to it using a wire rope powered from the main mill. Later, small petrol tractors were used although they were limited to two loaded wagons. The quarry suffered from the usual ups and downs of the industry with long periods of disuse. The final extraction of slate on this site was in the early 1960's. It was the last user of the tramway and following its closure the final section of track was lifted. There are several interesting structures and artifacts on the site including the large mill, which appears to be far to large for the modest tonnages the quarry produced, the remains of the barracks block, some sections of 2' gauge tramway and a Pooley's weighing machine. There is also a rather fine curved rock tunnel connecting two parts of the workings. This website is only intended to give an outline of Cwt y Bugail. The complete history of the undertaking may be read in the book: Blaen y Cwm & Cwt y Bugail slate quarries by M.J.T Lewis, ISBN 0-9522979-3-0. The waste tips of Cwt y Bugail with Blaen y Cwm quarry in the distance..
A 2 foot gauge weighing platform made by Pooley & Sons is still firmly secured in its seating at the top of the quarry. 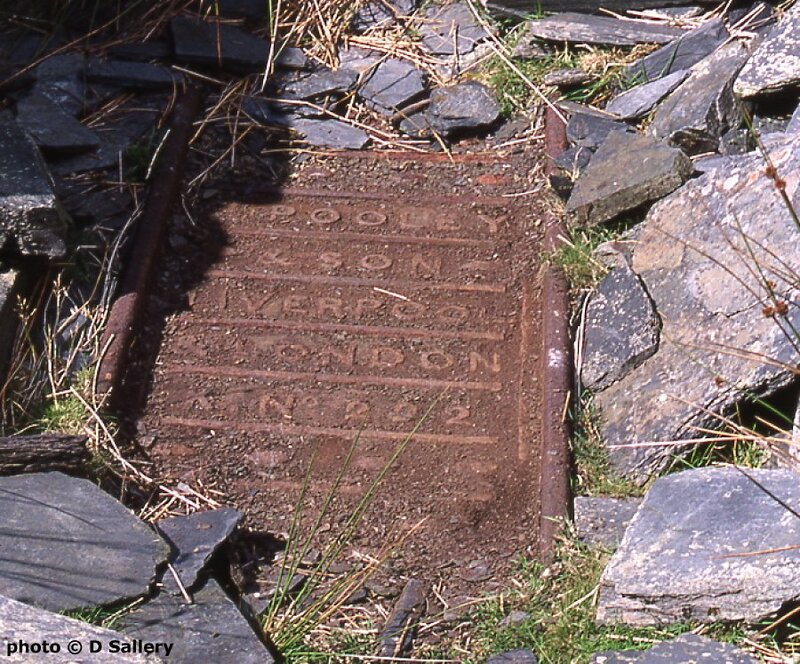 Weighbridges such as this were found at virtually all slate quarries. Generally all payment to the workforce was based on the tonnage of usable or waste rock extracted. 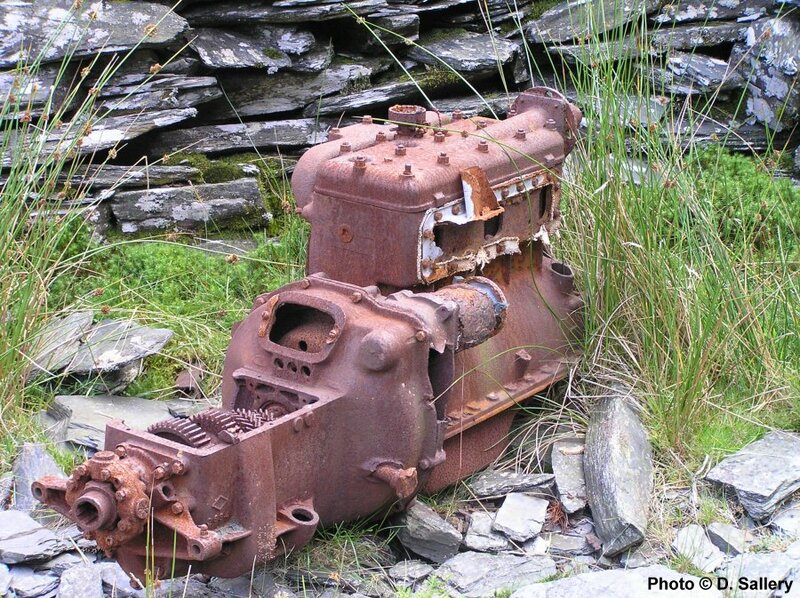 Rusted remains of an old lorry engine, used to provide power in the last year's of the quarry. 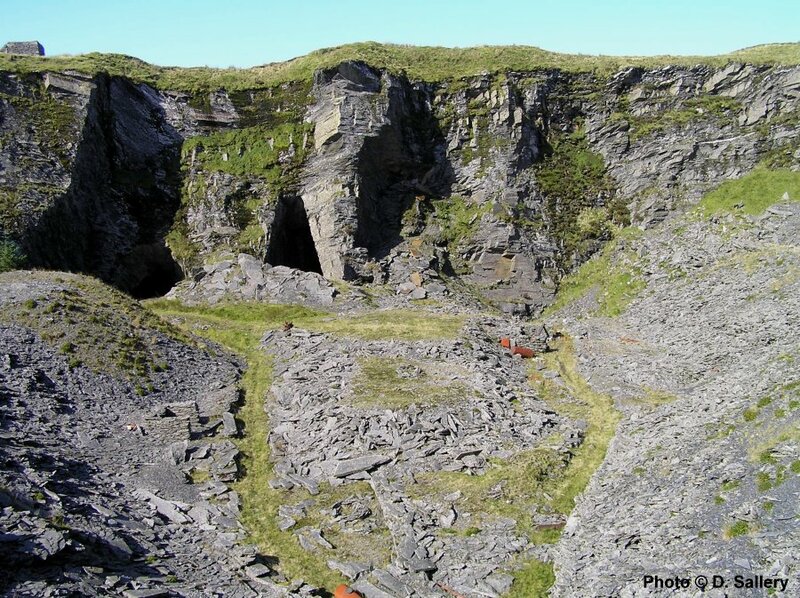 The quarry was initially an underground working accessing the rich 'Back Vein' which was the source of the finest slate in the Blaenau area. This later open pit working was on the 'North Vein' which produced an inferior product. Thanks to Richard Hayne for clarification. Most of the underground workings have now collapsed and access is not recommended. There is still some 2 foot gauge track in this area. Inside the ruined mill building. 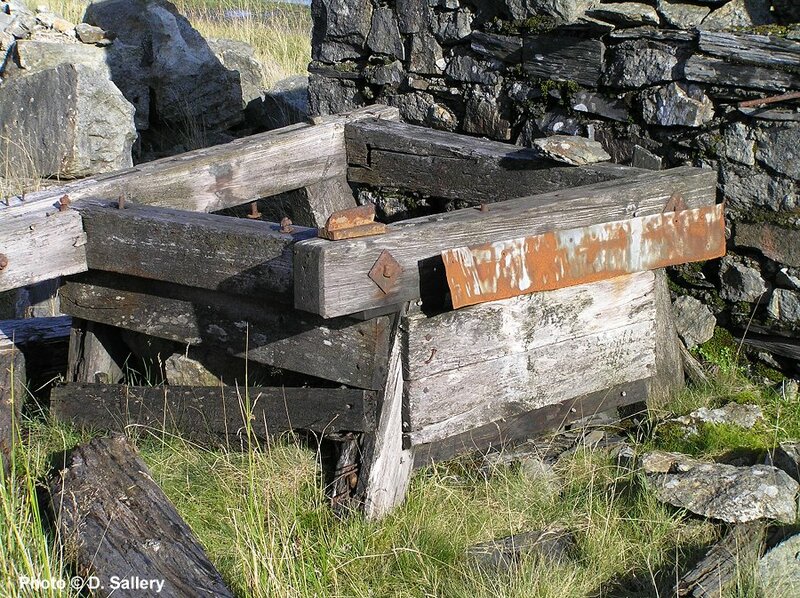 This wooden base once housed a slate dressing machine.